The markets opened on a positive note in line with global markets on signs of easing US-China trade tension who agreed to halt additional tariffs in the G20 meeting in Buenos Aires. Reversing early gains, the key equity indices traded in the red during the afternoon trade session on Monday as investors reacted to disappointing macro-economic data and a rise in global crude oil prices. According to market observers, investors reacted on weak second-quarter GDP figure and widening fiscal deficit made known after the markets closed on Friday. In addition, investor sentiments were also weighed down by a slowdown in vehicle sales. While the financials traded on a flat note, realty, power and utility stocks gained over 2%. In contrast, the healthcare and auto stocks witnessed selling pressure. Besides, ahead of the OPEC meeting this week, the crude oil prices surged on expectations of supply cuts by the oil cartel. The benchmark Brent Crude traded higher at $62.07 a barrel. Even the domestic currency weakened 63 paise against the US dollar, trading at Rs70.22 from its previous close of 69.59. However, the major indices moved up before the end of the trading session on Monday and closed with marginal gains over Friday’s close. India's factory output in November rose to an 11 month high on the back of improved demand, according to the Nikkei India Manufacturing PMI. The Nikkei India Manufacturing Purchasing Managers' Index (PMI) was recorded at 54 in November, up from 53.1 in October. This was the third consecutive monthly increase in the index. It also said that manufacturing operating conditions in India strengthened for the third successive month in November as healthier inflows of new orders encouraged companies to lift production and input buying to greater extent than in October. An index reading of above 50 indicates an overall increase in economic activity and below 50 indicates an overall decrease. "The Indian manufacturing sector continued to recover from ground lost in August, with November seeing the headline PMI climb to an 11-month high," said Pollyanna De Lima, Principal Economist at IHS Markit and author of the report released on Monday. She noted that the "relatively weak demand environment seen earlier in the year showed signs of abating, with clients unfazed by another round of increases in output prices and placing more orders regardless." The Nikkei report said that "heated demand" put higher pressure on capacities, which was reflected in a renewed increase in outstanding businesses. "Buoyed by stronger demand conditions and greater sales, manufacturers increased production at the second-quickest pace since October 2016," said the report. It further observed that goods producers created jobs in November. "The increase in employment softened slightly since October, but was nonetheless among the fastest seen in six years," it said. Commercial vehicles major Ashok Leyland Ltd on Monday said its sales went down by 9 per cent last month. In a statement issued here, the company said it sold a total of 13,121 units in November 2018, down from 14,457 sold during November 2017. Ashok Leyland shares closed at Rs107.25, down 4.54% on the NSE. Two and three wheeler maker TVS Motor Company Ltd on Monday said it logged 27 per cent sales growth last month. In a statement, the company said it sold 319,965 units in November 2018, up from 251,965 in November 2017. The company sold 307,142 two-wheelers and 12,823 three-wheelers last month as against 243,323 two-wheelers and 8,642 three-wheelers during November 2017. The company’s shares closed at Rs550.00, down 1.33% on the NSE. Amid reports of a deal between Saudi Arabia and Russia to cut crude production, Indian state-run oil firms continued to lower transport fuel prices for the eleventh straight day on Sunday, with petrol prices touching the lowest level in the ongoing fiscal across the major metros. Indian Oil Corporation shares closed at Rs132.85, down 1.30% on the NSE. Following a "highly successful meeting" here between US and Chinese Presidents Donald Trump and Xi Jinping, the leaders of the two largest economies have agreed not to impose new tariffs from January 1, 2019, and pledged to continue negotiations to seek a way out of the ongoing trade war. Maharashtra Seamless has bagged Rs920 Crore order from ONGC for supply of Seamless casings, Tubings, Line pipes and ERW Pipes. The company’s shares closed at Rs490.20, up 3.37% on the NSE. Adani Transmission received LoI (Letter of Intent) from PFC Consulting Limited for an Intra State Transmission Project in Uttar Pradesh on BOOM basis. The project “Obra-C Badaun Transmission Limited” has approximately 625 ckt kms and with this the cumulative transmission network reaches 13,548 ckt kms. The company’s shares closed at Rs218.30, down 3.02% on the NSE. Larsen & Toubro reported that its construction arm has won orders worth Rs1,127 crore across two business segments. The Metallurgical and Material Handling business has secured orders worth Rs755 crore. The Buildings and Factories business has secured an order worth Rs372 crores. L & T shares closed at Rs1,426.55, down 0.42% on the NSE. Sun Pharma received final approval from the US FDA (Food and Drug Administration) for its ANDA for generic version of Ganirelix Acetate Injection, 250 mcg/0.5 mL. Approx. annual US sales are US$67 million (ending Sep 2018). Sun Pharma shares closed at Rs455.30, down 7.52% on the BSE. 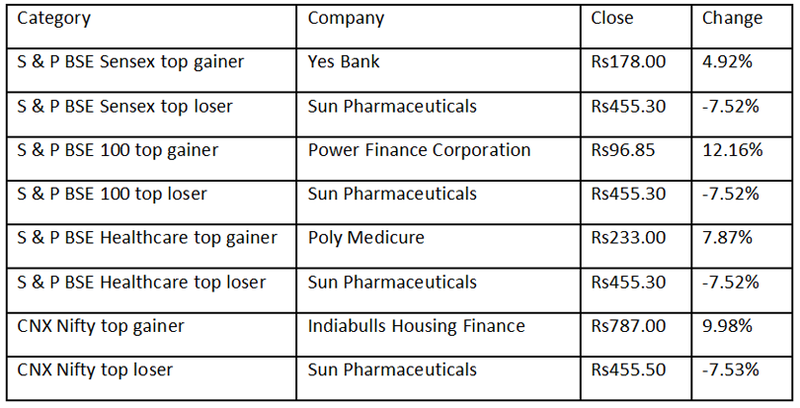 On Moneylife news, last Friday, a whistleblower had sent in a 150-page report on Sun Pharma and others connected to it. Cadila Healthcare reported that Zydus Cadila has received final approval from the US FDA to market Teriflunomide Tablets (US RLD- AUBAGIO). Teriflunomide is used to treat relapsing forms of multiple sclerosis (MS). The company’s shares closed at Rs358.05, down 1.98% on the NSE. The major indices of the Indian stock markets rallied on Monday and closed with gains over Friday’s close. On the NSE, there were 681 advances, 1,033 declines and 359 unchanged. India's benchmark stock indices advanced about 1% on Monday, as investors stepped up equity purchases after a string of declines last week. Firm Asian cues, and a persistent decline in global crude oil prices also buoyed investor sentiment, sending the Sensex over 370 points higher, while the broader Nifty topped the 10,600-mark. Buying was witnessed in the FMCG (fast moving consumer goods) and consumer durables stocks. The index pivotals -- finance and banking -- were 1.32% and 1% higher, respectively. Export-oriented stocks like IT (information technology) gained, while the healthcare traded lower. The overall market breadth was negative, with 1,067 stocks advancing and 1,536 declining on account of a 0.15% fall in the small-caps. HEG reported that its Board approved a proposal to buy back upto 13.63 lakh shares (3.41%) of the company for an aggregate amount not exceeding Rs750 crore at a price of Rs5,500 per equity share. Lupin has received approval for its Clomipramine HCl Capsules USP, a generic version of SpecGx's Anafranil Capsules, from the US FDA. It is indicated for the treatment of obsessions and compulsions in patients with OCD. Lupin has also received approval for its Potassium Chloride for Oral Solution USP, 20 mEq from the US FDA. It is indicated for the treatment and prophylaxis of hypokalemia with or without metabolic alkalosis. The major indices of the Indian stock markets rallied, after a dip, on Tuesday and closed with gains over Monday’s close. On the NSE, there were 792 advances, 921 declines and 342 unchanged. The key equity indices were higher on Tuesday, but banking stocks were subdued. Buying was witnessed in energy and IT (information technology) stocks. On Monday, the Centre's recapitalization announcement of Rs42,000 crore to unhealthy PSU (public sector undertakings) banks boosted investor sentiments. Currently, 11 of the 21 state-run banks are under RBI's (Reserve Bank of India) Prompt corrective action (PCA) framework which restricts weak banks from carrying out certain operations. Granules India has received USFDA (Food and Drug Administration) approval for its ANDA for Methylphenidate Hydrochloride Extended-Release Tablets USP. The approved ANDA is therapeutically equivalent to the RLD - Ritalin SR Sustained-Release Tablets of Novartis Pharmaceuticals. Alembic Pharmaceuticals has received approval from the USFDA for its ANDA Temazepam Capsules USP, therapeutically equivalent to RLD, Restoril Capsules of SpecGx LLC. Temazepam Capsules are indicated for short term treatment of insomnia. The major indices of the Indian stock markets rallied on Wednesday and closed with gains over Tuesday’s close. On the NSE, there were 593 advances, 1,131 declines and 340 unchanged. The benchmark S&P BSE Sensex advanced 200 points on Wednesday, extending its third straight session of gains led by strong gains in the IT (information technology) stocks. In addition, the markets also took cues from an appreciating rupee and retreating foreign fund inflow as India's macro-economic conditions improved largely owing to declining crude oil prices. However, the Brent Crude prices logged a slight increase which comes ahead of the OPEC (Organisation of Petroleum Exporting Countries) meeting next week. The benchmark crude price traded at $61 a barrel. The local currency strengthened to Rs70.66 against a US dollar from its previous close of 70.76. IT stocks led the gains on Sensex, followed by Teck (technology, entertainment and media). In contrast, healthcare, oil and gas stocks witnessed selling pressure. Appearing before the Parliamentary Standing Committee on Finance, RBI (Reserve Bank of India) Governor Urjit Patel said that the effect of demonetisation was temporary while he will respond to issues related to the RBI's autonomy and reserves in the next 10 to 15 days in the midst of differences with the government. YES Bank's foreign currency issuer ratings was downgraded to Ba1 from Baa3 by Moody's Investors Service. The outlook, where applicable, has been changed to negative from stable. Cadila Healthcare reported that Zydus Cadila has received final approval from the USFDA (Food and Drug Administration) to market Baclofen Tablets (US RLD- Lioresal®). Baclofen is used to treat muscle spasms caused by certain conditions such as multiple sclerosis, spinal cord injury/ disease. The major indices of the Indian stock markets rallied strongly on Thursday and closed with gains over Wednesday’s close. On the NSE, there were 863 advances, 858 declines and 342 unchanged. India's equity indices jumped on Thursday, their fourth straight session of gains, amid expectations the US Federal Reserve would slow its pace of interest rate increases. Doubts about the Fed's future tightening also spurred the domestic currency, with the rupee vaulting 74 paise so far on Thursday's trade. The financials, which led the gains, were up over 1.5% while selling pressure was witnessed in the export-dependent IT (information technology) stocks as the rupee strengthened to Rs69.88 per US dollar from its previous close of 70.62. Private sector ICICI Bank Ltd will grow its retail loan by 40% in Tamil Nadu, said a senior official. Speaking to reporters here, Anup Bagchi, Executive Director, said the company is expecting to grow retail loan disbursement in Tamil Nadu by over 40% to Rs13,000 crore this fiscal. He said the growth will happen across retail loans like consumer, home, agriculture. This fiscal ICICI Bank plans to grow its disbursement of consumer loans by nearly 50% to Rs5,000 crore. The bank will also increase its home loan disbursement by nearly 40% to Rs3,700 crore. Within the home loans portfolio, the bank is focusing on the affordable housing segment and expanding its presence across tier two and three markets. The major indices of the Indian markets closed on Friday with minor gains over Thursday’s close. On the NSE, there were 897 advances, 822 declines and 343 unchanged. The key equity indices settled on a flat-to-positive note on Friday amid concerns falling crude oil prices and an inflow of foreign funds. However, markets had reversed initial gains to slip in the red during the late afternoon session of trade as investors turned cautious ahead of the release of key macro-economic data. Q2 GDP, fiscal deficit and core sector growth data will be released later in the day. Banking, oil and gas and telecom stocks witnessed selling pressure on the BSE. In contrast, IT, realty and healthcare stocks outperformed the benchmark index, gaining 1%-2%. Reserve Bank of India (RBI) has relaxed the rules to sell or securitise NBFCs’ (non-banking finance companies) loan books to ease persistent stress in the sector. In a bid to help non-banking finance companies overcome liquidity issues in the backdrop of the IL&FS imbroglio, RBI has cut the minimum holding period requirement for NBFCs raising funds via securitisation of loans of original maturity above 5 years. In respect of loans of original maturity above 5 years, the minimum number of instalments to be paid before securitisation is now six monthly instalments (12 earlier) or two quarterly instalments (four).